Our skin is truly one of the toughest and most durable organs in our body. It can withstand a harsh environment and exposure to toxic substances. However, a constant exposure to these conditions, and of course the normal effects of aging, tends to damage our skin. Different beauty products have now flooded the market to somehow reduce the signs of aging. 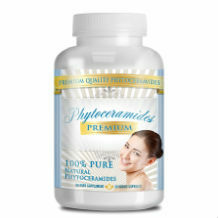 In this article, we will talk about one example of such product which is called Herbal Nutrition Phytoceramides. 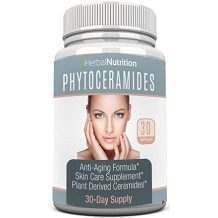 This dietary supplement claims to provide a younger looking skin, thicker hair, minimize fine lines, and promote faster and stronger growing nails. According to the product’s label, this dietary supplement should be taken once a day. The manufacturer didn’t provide any other information about taking this product such as when is the best time to take it and whether you should take it before or after a meal. When it comes to the dosage, the product only contains 40 mg of phytoceramides which is low compared to similar products on the market. The product’s website does not mention any possible side effects when taking this product. Pregnant women, nursing mothers, children below 18 years of age, and people who have a known medical condition should consult their physician before taking this supplement. You can purchase this product from the manufacturer’s website. They are offering a buy one get one free promo which will cost an individual $26.95. This will get you a 2-month supply. You can also purchase a 3-bottle and 4-bottle package which will cost you $36.95 and $46.95 respectively. All purchases come with a free shipping. Unhappy buyers can return this product within 60 days of purchase for a full refund less shipping and handling fees. The product’s website didn’t specify, however, if they’re going to accept opened or partially used bottles. In conclusion, the product seems to offer its buyers some pretty good discounts. The product does not contain any gluten and animal products which is good news to those who want an all vegetarian supplement. Still, the product’s potency seems very low compared to other products. The phytoceramides are also derived from rice which has been found to be less effective to those derived from wheat. The return policy of this dietary supplement is also not very clear. We recommend looking for a product that has a higher potency of ingredients and which comes backed with a more solid guarantee.